I had today off from work, so I visited my parents up in Sonoma county for the long weekend. This morning, I got to lounge in my own bed, cuddle my kitty, and take a nice walk on the country roads – just what I needed. 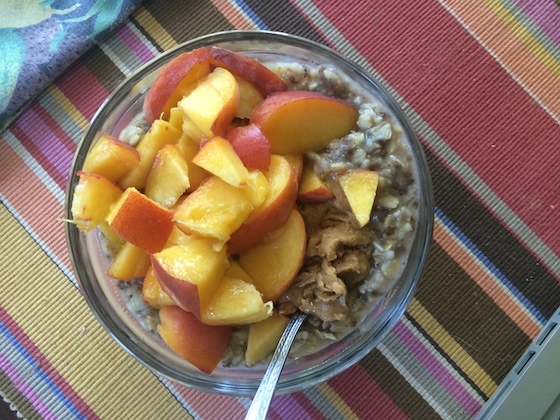 Then, I made my favorite breakfast: oats cooked with raisins, chia seeds, cinnamon, and vanilla, then topped with peanut butter and a sliced peach. So filling and yummy. Normally that breakfast keeps me full for hours and hours, but today I got hungry again around noon. Lucky thing, too, because my mom was just making this delicious lunch. 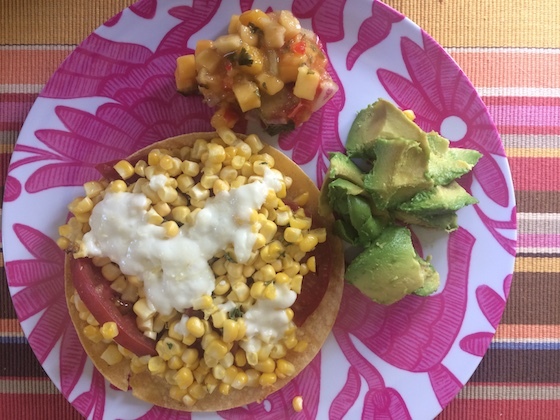 A corn tortilla topped with tomatoes, corn, feta, avocado, and mango salsa. Fresh summer corn is my absolute favorite. After lunch, we headed off to the Marin county fair. I was still a bit hungry, and knew we wouldn’t be eating for a while, so I grabbed this snack on the way out the door. 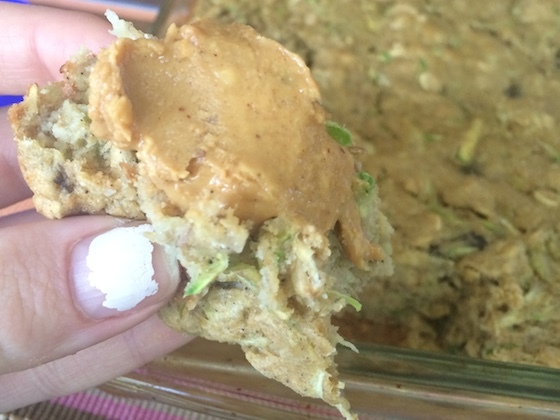 A small square of fresh baked banana zucchini bread topped with a smear of peanut butter. My first attempt at this recipe and it turned out really well – expect a post about it soon! We spent the rest of the afternoon and evening at the fair. We admired the cows and horses, watched an acrobatics show, rode the Ferris wheel, and enjoyed an incredible fireworks show. The perfect all-American day. 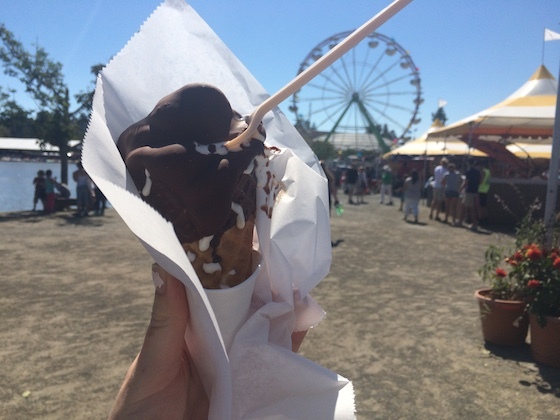 For an afternoon snack I had chocolate dipped soft serve – a fair classic, no? We put off dinner for a bit longer than we probably should have, so by the time we started to survey the options I was tired and a little cranky – not in the best shape to figure out what would taste great and satisfy me most. After waffling a ton, I decided on this crawfish dish over rice, simply because my parents were both getting things from the same stand. 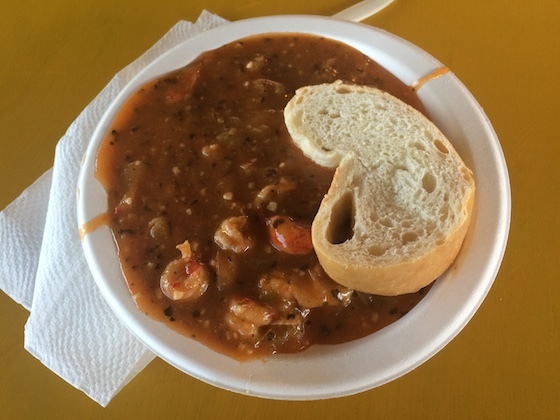 It was actually warm and hearty and tasted great. By the time I finished the bowl I was refreshed, and in a much better mood. 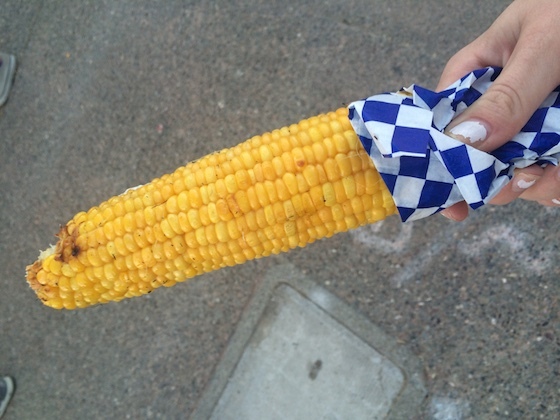 I was still a bit hungry, so I treated myself to one of my favorites: roasted corn. Yummy! It left me totally satisfied and happy. All in all, a fun-filled day! And now, bedtime. I’m totally exhausted. Lucky for me, I get to sleep in again tomorrow!